Yemen: "A frightening and fatal condition I’d never seen before"
In our project hospital, the growing need for neonatal and maternal care was clear, as these are the vulnerable groups affected by Yemen’s ongoing war. Unfortunately, we saw an increasing number of sick newborns in our ER who suffered complications relating to poor antenatal care, unhygienic delivery practices and difficult births at home. Poverty, low level of education amongst mothers and the distance from health care facilities only aggravate the problem. A case I remember vividly is an 8-day-old baby boy who was delivered at home in a village. His mother brought him to ER because he gradually stopped feeding for a few days, and that morning he developed some ‘strange movements’. In front of me was a dehydrated 2.7kg baby: his neck was curved backwards, his limbs were stiff and straight, and his body repeatedly spasmed. Although I’d never seen a case like this before, I immediately recognized this frightening and fatal condition – neonatal tetanus. Neonatal tetanus occurs only in newborns who have not acquired immunity from a vaccinated mother, particularly when a non-sterile instrument was used to cut the umbilical cord. It hardly exists in developed countries or places like Hong Kong, because it is easily preventable with immunization programs, comprehensive antenatal care and safe delivery practices. We quickly gave medications (to neutralize the tetanus toxin), an IV drip, antibiotics, and sedatives to control the spasms. His condition slightly improved. However, the spasms continued at a reduced frequency. These spasms in tetanus are easily triggered by surrounding light or sound. In the next 24 hours, I repeatedly went to the high dependency unit to check his condition. He was inside an incubator almost fully covered by dark cloth. His spasms continued, even to the point where he struggled to breathe. I gradually increased the dosage and frequency of the sedatives. Every spasm was painful for him - it was truly a depressing and unforgettable sight. In the end, I decided to transfer him to an MSF paediatric unit in Taiz, where hopefully a better nursing environment and the paediatrician’s input could increase the chance of his survival. However, the ambulance journey to Taiz could take up to 45 minutes depending on traffic. It was a risk I decided to take. Fortunately, I received confirmation that evening about his safe arrival. Fortunately, with medications, basic monitoring, proper feeding and parent education, many sick newborns and children were treated and discharged home. Although the mothers and female caretakers’ faces were covered by veils, their expressions of gratitude and happiness shone through. I felt a trust and bonding with them that transcends culture, language and gender. Witnessing their babies’ transition from very ill patients in the ER to thriving babies on discharge was undoubtedly my biggest satisfaction. I hope they will always remember ‘the Chinese doctor’, as they would call me, as someone who went to see their babies at 10 a.m. every morning. 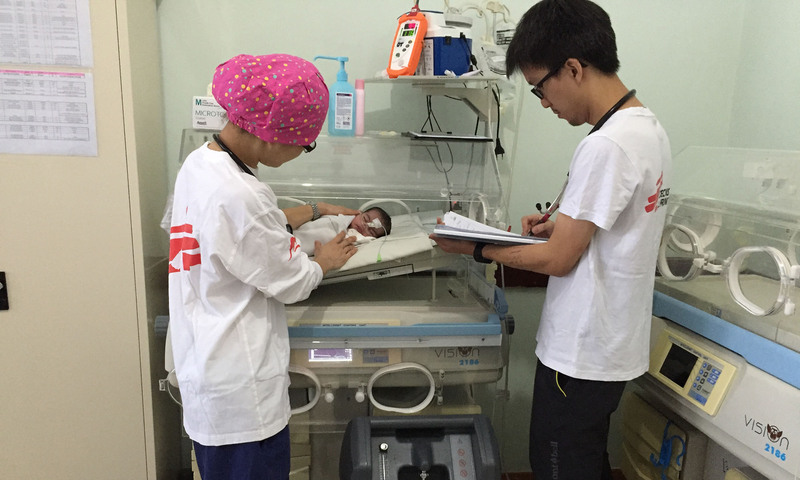 ER doctor Jimmy Leung from Hong Kong worked in the hospital supported by MSF in Ibb governorate, Yemen from August to November 2016 for his first mission with MSF.